What is the source of the doomsday date of 2012 that so many are talking about? 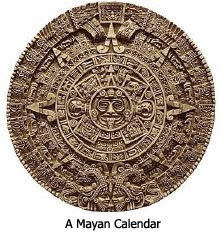 The Mayans had three main calendars.3 One was a solar calendar that was based on 20 day months. The second was a ceremonial calendar that was related to the 260 day cycle of Venus. It was their third measure of time, the Long Count Calendar, that was related to the year 2012. The Long Count Calendar was a measure of "world age cycles" that repeat over and over again. This calendar was divided into five units or cycles that started with the mythical date for the creation of the Mayas — August 11, 3114 BC. The fifth cycle was supposed to end on a date that corresponds to December 21, 2012 on the Gregorian Calendar that is used in the Western World. Since the calendar ends on that date, some modern day interpreters have jumped to the conclusion that it marks the date for the end of the world. The man who put 2012 on the map as a pivotal date for world history was José Arguelles, a Mexican-American, who authored a mystical book in 1987 titled The Mayan Factor.4 He was also instrumental that year in organizing a worldwide event called the Harmonic Convergence.5 During two days in August, people were urged to gather at sacred sites to awaken the "energy grid" of the world and thus initiate a 25-year era of spiritual growth that would culminate in 2012. Meanwhile, the History Channel on television has promoted the 2012 craze with a zeal, broadcasting a whole series of programs focused on the date: "Mayan Doomsday Prophecy" (2006), "Last Days on Earth" (2006), "Doomsday 2012: The End of Days" (2007), "Seven Signs of the Apocalypse" (2009), and "Nostradamus 2012" (2009). In the next installment of this 2012 series, we'll look at the apocalyptic factors that are used to substantiate the doomsday date of 2012. 1. Lawrence E. Joseph, Apocalypse 2012: An Investigation into Civilization's End (New York: Broadway Books, 2007), page 12. 2. Synthia Andrews and Colin Andrews, The Complete Idiot's Guide to 2012 (New York: Alpha, 2008), page 11. 3. Mark Hitchcock, 2012: The Bible and the End of the World (Eugene, Oregon: Harvest House Publishers, 2009), page 32. 4. José Arguelles, The Mayan Factor: Path Beyond Technology (Rochester, Vermont: Bear & Company, 1987). http://en.wikipedia.org/wiki/Harmonic_Convergence, accessed October 16, 2009. 6. Pauline O'Connor, "12/12/12: The end of the world as we know it?" Los Angeles Times, February 28, 2008, http://theguide.latimes.com/general/12-12-12-the-end-of-the-world-as-article, accessed on October 16, 2009.